Dun, dun, dun. Math. Okay, not everyone shares the same dislike for math as I do. Whether you like doing math or not, it is a major, major part of our daily lives. Our math teachers were right. I can’t sew, cook, or even sing without math being involved. How do we get our cute little preschoolers ready for the math that is to come in their future? Happily for me, this kind of math is fun (as compared to geometry…). On Becoming Preschoolwise has some great ideas starting on page 123. Math heavy on the patterns. Oh that sneaky geometry working its way in (I know, I know, some of you are math queens). Stacking rings help teach patterns and spacial relations. You can do pattern activities in bead stringing. You can play with pegboards. Pattern blocks are super fun. I think preschoolwise makes an excellent point in that you need to supervise and instruct in these activities when you want there to be mathematical learning happening. Any of these toys are fun alone and can lead to some great creativity. When you want to teach math, however, you want to focus on the patterns. This means the child needs to follow a pattern when stringing those beads. A pattern sheet should be used for the blocks and the pegs. The time will come when pattern activities can be created by your child, but he needs to understand patterns first. This is another fun way to introduce math. 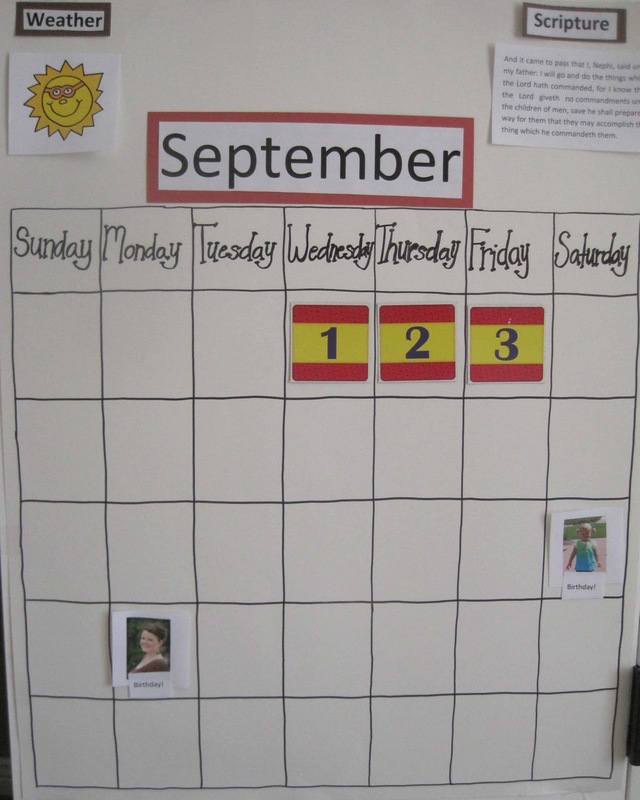 I have a post on our homemade calendar here: http://learningdevelopmentactivities.blogspot.com/2010/09/home-made-calendar.html. You can also buy calendars you can change daily (we have one from Melissa and Doug). I like my dollar store, poster board creation best. We do our calendar each morning. Brayden’s first grade teacher has a great addition to the calendar idea. She has three little arrows at the top of the calendar that can be moved. They say “yesterday” “today” and “tomorrow.” They move those words each day. Count, count, count. Count everything. You can count arms as you put a shirt on. Count toes as you do bath time. Count the number of grapes on your plate. I find counting magical. Since Brayden was a baby, I have used counting to maintain patience in the child. When I clipped his fingernails, we counted each clip. I count so much. It helps the child focus on counting rather than the fact that he has to sit still for three minutes. You can use this in cars, waiting rooms, etc. McKenna can count beyond twenty–that is only because we count constantly. As a high school math teacher, I want to encourage parents to keep math fun! Yes, many adults dislike math. Some even despise it! However, we do our children a disservice if we let them know some of our true feelings. Few things frustrate me more as a teacher, than when a parent of a struggling student says (in front of the student) "I was never good at math…I hated it". Even if that's true, PLEASE keep it exciting for your child. I really believe that one of the reasons our country is so far behind in math is because kids just hear how hard and terrible it is. Math is everywhere, it is unavoidable, and it CAN be fun!Okay…off my soapbox now! Great advice Jamie! I definitely need to be careful about it because I am one who never enjoyed math. I will remember your words! Counting IS magical! I made my husband count through every contraction, and it was wonderful, because when he got to 35, I knew it was going to start easing up.Also, my sil is a 1st grade teacher and says puzzles encourage math skills as well. Yes Katie! I don't know why I didn't include that. Thanks for pointing that out!